Fought on the hilly ground between Lake Garda and the Adige River, a dozen miles northwest of Verona, the Battle of Rivoli was Bonaparte’s most decisive victory in his first Italian campaign. The defeat at Rivoli led to the failure of the last Austrian attempt at relieving Mantua. After the capitulation of the fortress at the beginning of February 1797, Bonaparte could move his army to the Austrian borders, thus speeding up the chain of events leading to the end of the war in Italy and the Peace of Campo Formio. After the Battle of Arcola in November 1796, both armies, tired, depleted, and worn to rags, would have welcomed a period of rest in winter quarters. Their hopes were to remain unfulfilled. After recent French defeat in Germany, the Directory looked toward peace and sent Minister Henri Clarke to Italy for armistice talks. Expecting Mantua to surrender very soon, Bonaparte opposed a cease-fire. It was the Aulic Council in Vienna, however, that entertained stronger reasons for reopening hostilities in Italy as soon as possible. The first was to make a new attempt at rescuing Mantua before lack of supplies and malarial disease forced Feldmarschall Dagobert Graf Würmser to capitulate. Political reasons were also at work. To the lower social classes supporting the ancien régime, the fall of Mantua would mean the final victory of the French Revolutionary cause in Italy. Moreover, the pope might be forced to consent to wage war against Revolutionary France by a new show of Austrian military enterprise. Such pressing needs led Vienna to send orders to the Austrian commander in Italy, Feldzeugmeister Joseph Alvinczy Freiherr von Berberek, for a new campaign that- rather unusually-was to begin in winter. Beginning in December, a constant inflow of replacements started filling the gaps in the Austrian army. Admittedly, the quality of the new troops-recruits, Vienna volunteers, depot units-was on the average poor. By the new year, however, Alvinczy could field about 47,000 men for campaign service, the Mantua garrison (about 20,000) and some thousands for rear duties not included. Once again, the Austrian plan to relieve Mantua, devised by the same Colonel Franz Weyrother later responsible for the plan at Austerlitz, provided for two separate lines of advance. A diversionary force, in two columns under Feldmarschalleutnant Adam Freiherr von Bajalich (6,000 men) and Feldmarschalleutnant Giovanni Marquis di Provera (9,000), would, respectively, push westward over the plain toward Verona and Legnago. By feinting operations on the Adige, they intended to draw Bonaparte’s attention. Despite the approaching winter, however, the main thrust was to be delivered from the Alps. Under the direct command of Alvinczy, about 28,000 men in six columns would move from Trento down the Adige valley and through the chain of mountains (collectively called Monte Baldo) between the Adige and Lake Garda. After breaking through the bottleneck at Rivoli, they would make for Mantua. This plan apparently rested on some uncertain assumptions: (1) that a substantial part of Bonaparte’s army was south of the Po preparing to invade the Papal States; (2) that Bonaparte would mistake the diversionary force for the main army and would concentrate most French troops behind the Adige from Verona to Legnago; (3) that consequently only minor forces would be left at the strong defensive position of Rivoli in the upper Adige valley and, once attacked, they would not be able to receive immediate support; (4) that the Austrian columns could advance over mountain roads and tracks covered with snow in a coordinated way and with relatively small manpower consumption; and (5) that Würmser could actively cooperate by launching sorties from Mantua. None of these assumptions turned out to be valid. The (French) Armée d’Italie had also received some replacements. Its general situation, however, did not look good. Besides the chronic lack of equipment and supplies, after nine months of campaigning Bonaparte had run short of capable generals and knew that the fighting quality of his troops was declining. The French deployment in January 1797 was as follows: General Pierre Augereau’s division (9,000 men) behind the Adige between Verona and Legnago; André Masséna’s (9,000) around Verona; Barthélemy Catherine Joubert’s (10,250) at Rivoli and on Monte Baldo; General Antoine Rey’s (4,100) at Brescia and along the western shore of the Garda; a reserve under General Claude Victor (2,400) at Castelnuovo and Villafranca; and General Thomas Alexandre Dumas’s and Claude Dallemagne’s blockading corps (10,200) around Mantua. To the south of the Po, there was only a small column under General Jean Lannes, with 2,000 French and several thousand Italian troops. On 7 January Bonaparte left for Bologna, where three days later he received the news that Provera’s column had appeared before Legnago. He immediately ordered Lannes back to the Adige, and rushed to his headquarters at Roverbella, just north of Mantua, where he arrived probably early on the twelfth. As Alvinczy had hoped, by that time Bonaparte still believed that the main threat was on the lower Adige and thus made his dispositions accordingly. Later that day, however, he started receiving reports announcing that Joubert was under attack at La Corona, a steep defile on Monte Baldo, five miles north of Rivoli. To ascertain the real magnitude of this new threat, Bonaparte asked Joubert for more information. Early on the thirteenth, Joubert realized that he was facing a strong and determined army (actually, 28,000 men). While three of Alvinczy’s columns were marching down the valley roads along the Adige (Prince Reuss’s and Ocksay’s on the western, Vukassovich on the eastern bank), three other columns (Köblös’s, Lipthay’s, and Lusignan’s) trudged along the tracks of Monte Baldo covered with snow. Later in the afternoon, fearing being outflanked, Joubert withdrew to Rivoli. By 3:00 P. M., thanks to Joubert’s reports, Bonaparte knew that the main attack was coming from the north. He reacted swiftly, rushing Masséna with three demi-brigades and some cavalry to Rivoli. Rey’s division was also ordered to move to Rivoli, a brigade under General Joachim Murat being ferried across Lake Garda. At Rivoli, where now both Bonaparte and Alvinczy were expecting to fight a decisive battle, less than four miles separated the Adige from Lake Garda. Over this ground, a two-layer amphitheater facing the southern slopes of Monte Baldo formed one of the strongest defensive positions anywhere in the Italian Alps. The village of Rivoli lay (and still lies) in the center of this hilly semicircle that stretches to the north, the west, and the south, with the steep bank of the Adige to the east. The outward and higher layer of the amphitheater has a diameter of about three miles, starting from the Chapel of San Marco to the north, and ending at Monte Pipolo to the south. A milewide plateau runs throughout its extension. Three villages, San Giovanni, Caprino, and Pesina (from east to west), are located on the plateau along the banks of a small stream called the Tasso. The inner layer has a diameter of a mile and a half. A peculiar feature made Rivoli an excellent defensive position. While the defender could easily undertake operations with all three arms (infantry, cavalry, and artillery), a network of relatively good roads being available to approach the battlefield from the south, the attacker had no such facility, as the northern accesses from Monte Baldo, even in more favorable weather, were only practicable to infantry. This suggested that Alvinczy’s field artillery and cavalry should file along the roads on either side of the Adige. From the river valley bottom, the only exit to the Rivoli amphitheater was by the road on the western bank. It led to the Dogana Inn and the main village, after winding up to an inner plateau through a steep, narrow, and easily defensible defile. By the evening of 13 January, Joubert had deployed his troops over a restricted area along the edges of the inner plateau, where they could take advantage of some entrenchments. Three Austrian columns (from east to west, under Ocksay, Köblös, and Lipthay, respectively) had encamped for the night on the heights north of the Tasso. Lusignan was farther to the west, with orders to make a long outflanking detour and reach the southern side of the amphitheater at Monte Pipolo, thus cutting off Joubert’s line of retreat and preventing Bonaparte from sending him support. Lusignan’s column was, however, considerably behind schedule because of the snow and the bad dirt tracks. Bonaparte joined Joubert during the night, rushing ahead of Masséna’s troops. From Bonaparte’s recollections and most French sources, we learn that once on the spot he immediately recognized the enemy plan and took adequate countermeasures. As a matter of fact, later that night Joubert’s division advanced to regain control of the outward plateau south of the Tasso. In this sector, about 9,000 French were now facing 12,000 Austrians, the latter being short of artillery and rations. Following the French advance, skirmishes broke out at daybreak on the fourteenth. The combat rapidly escalated along the line, ebbing and flowing, but with no decisive outcome. After a couple of hours, around 9:00 A. M., Lipthay managed to outflank the French left and routed two demi-brigades (the 29th and 85th). By that time, however, the awaited reinforcements appeared on the southern edge of the battlefield. Masséna brought the 32nd forward, and by 10:30 A. M. the French left was restored. Farther east, the 14th demi-brigade, under General Louis-Alexandre Berthier, were gallantly resisting Ocksay’s attack. Meanwhile, Prince Reuss’s column had started climbing up the road leading from the valley bottom to the inner plateau, receiving substantial support from the guns Vukassovich had deployed on the eastern bank of the Adige. On higher ground, the 39th demi-brigade put up fierce resistance against an enemy that was numerically superior, but was forced to advance uphill in long road columns. With great perseverance, Reuss’s troops eventually succeeded in pushing the French out of their entrenchments and started streaming over the inner plateau. The prospect of a junction between the column from the Adige and those coming down the ridge posed a serious threat to the French right flank and rear. Joubert and Berthier set to work, however, to rally their men for a counterattack against Reuss. Meanwhile, about 250 cavalry under generals Charles-Victor Leclerc and Antoine Lasalle charged the troops under Köblös and Ocksay, which after hours of fighting lay scattered on the plateau. 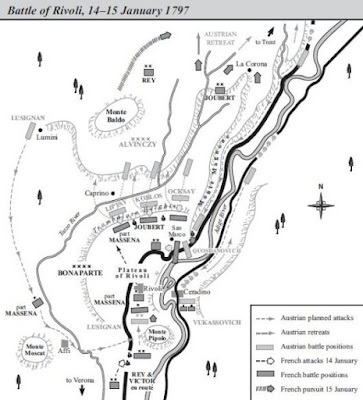 Some Austrian units apparently panicked and started retreating, partly uphill, partly down the road to the Adige valley bottom, the latter causing some disorder in Reuss’s tightly packed column. It is believed that at this crucial point two Austrian ammunition wagons exploded, thus spreading further chaos among the infantry ranks. Certainly it is a fact that most of Reuss’s units broke and fled down the road to the Adige. 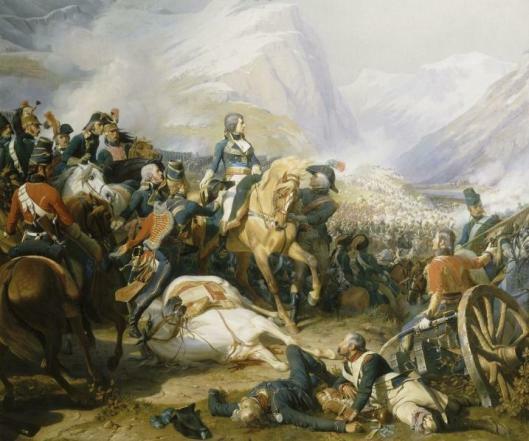 With effective cavalry and artillery support, Joubert and Masséna moved forward again and took definitive control of the outward plateau and the villages, repulsing the Austrians toward Monte Baldo. As the main action was being fought, around 11:00 A. M. Lusignan’s column appeared on Monte Pipolo, at the southern edge of the amphitheater. It was, however, too late for Lusignan’s force to influence the battle’s outcome. Even worse, he found himself trapped between the French army at Rivoli and the reinforcements approaching from the south. Attacked from many sides, Lusignan’s men retreated in great disorder, leaving hundreds of prisoners behind. By late afternoon, the Battle of Rivoli was over and Alvinczy’s army in full retreat. Bonaparte did not sleep on the battlefield. Being informed that Provera was now in sight of Mantua, he entrusted Joubert with the pursuit of the Austrian army (which Bonaparte’s subordinate duly embarked on, clashing again with Alvinczy on the fifteenth) and then himself rushed with Masséna’s and Victor’s divisions to face the new threat. Austrian losses at the Battle of Rivoli and in the following pursuit are estimated at 14,000 dead, wounded, stragglers, and prisoners. The French had 5,000 losses. On this figure, however, sources are obscure, as usual. At Rivoli Bonaparte showed most of his superior military skills at their best. The concentration of his army at Rivoli was executed at an exceptional speed, the night march of Masséna’s division being one of the keys to victory. During the battle, Bonaparte succeeded in always keeping his numerically inferior army concentrated in a central position. He was, moreover, also favored by the excellent defensive ground, some faulty assumptions made by his opponents, the poor general quality of the Austrian army, and the lack of coordination between Alvinczy and his subordinates. Had Provera succeeded in arriving at Mantua on 13 January, he would have forced Bonaparte to choose between two alternatives: to rush in support of Joubert, thus risking Mantua being rescued; or to reinforce the French forces around the fortress, thus abandoning Joubert to his fate. In either case, the outcome of the campaign would have not been the same. References and further reading Boycott-Brown, Martin. 2001. The Road to Rivoli: Napoleon’s First Campaign. London: Cassell. Esposito, Vincent J., and John R. Elting. 1999. A Military History and Atlas of the Napoleonic Wars. London: Greenhill.